Human resources managers and mid-level leaders hear it all the time: employees want wellness benefits. Whether those are in the form of more flexible work schedules, exercise programs, mental health resources, or financial benefits, employees want support in balancing their increasingly busy lives. Companies don’t have to be convinced of this need, as they have a court side view of the impact unwell employees have on business goals and objectives, from lower productivity to lower retention to disengagement. However, implementing a wellness program isn’t a one-step solution. It requires a culture shift, where the organization begins to emphasize employee well-being—not just as a standalone program, but in all of the policies, programs, procedures, and behaviors the company displays. The only way to make that change is with the buy-in of the most senior executives, the CXOs. Employee wellness programs are often seen as something that fall under the scope of the human resources department. Just as providing a good customer experience goes beyond the sales department or integrating technology goes beyond the scope of the IT department, building a culture of health goes beyond human resources. It should be a company-wide mission, and the key people to ensure that happens are the members of the C-suite. For any directive, support from senior leadership shows it is a priority and this support is critical in establishing a successful wellness program. Studies show that when leaders publicly recognized their employees’ healthy actions, the companies had higher employee health improvements and medical cost improvements. The same results were shown in organizations where leaders were seen as role models for work-life balance. Senior leaders also have a larger megaphone, so when they communicate the purpose and benefits of wellness programs, employee awareness increases and the programs have more success. What is even more influential than senior leaders recognizing employees’ wellness efforts or communicating about the programs is when those leaders directly participate in the wellness offerings themselves. Reebok, a fitness footwear and apparel company, described how leadership support of wellness was essential in creating higher participation and engagement of the program among employees. When the company built its new Boston headquarters in 2017, it featured a state-of-the-art fitness center. Managers encouraged employees to take time to incorporate physical activity in the day, but what may have had the most impact was when employees saw the Reebok president regularly participating in a CrossFit class at the fitness center at lunchtime. More than any directive, the sight of the leader working out emphasized the focus on healthy lives. It’s not enough for mid-level managers and human resources to be convinced that executives need to be involved; executives need to believe this too. To support wellness programs, senior leaders first must understand the benefits and why their company needs the initiative. In years past, human resources might have suggested an employee initiative with the argument that employees have requested it or because it’s the right thing to do. However, in a competitive, quantitative business environment, this rationale no longer will suffice. Human resources must become increasingly sophisticated in approaching business recommendations. Bringing senior executives on board requires understanding the audience and the company’s business goals. Keep in mind that executives typically do not have the front-line view or interactions with employees that managers and human resources do, so they may have not heard the same requests for health benefits that support a healthy lifestyle. 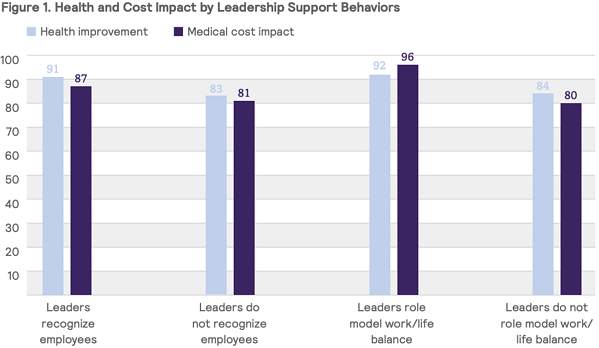 Although it may seem like a crystal-clear need, wellness benefits may not even be on a senior leader’s radar, so providing the background, education, sense of urgency, and the cost/benefit are essential for making the change. When approaching the concept of a wellness program with decision makers, consider these key tactics. Senior leaders have their own stress to manage. They are under constant pressure to ensure the business performs well and make the most of limited resources. In this environment, even good ideas can be dismissed if the relevance of those ideas isn’t immediately apparent. Champions of employee health initiatives must work to alter that perception so executives can quickly understand what’s in it for them—and the company. This means linking a wellness program to key business outcomes. Reducing costs is a constant goal for companies. While implementing a wellness program may cost money, so do unwell employees. 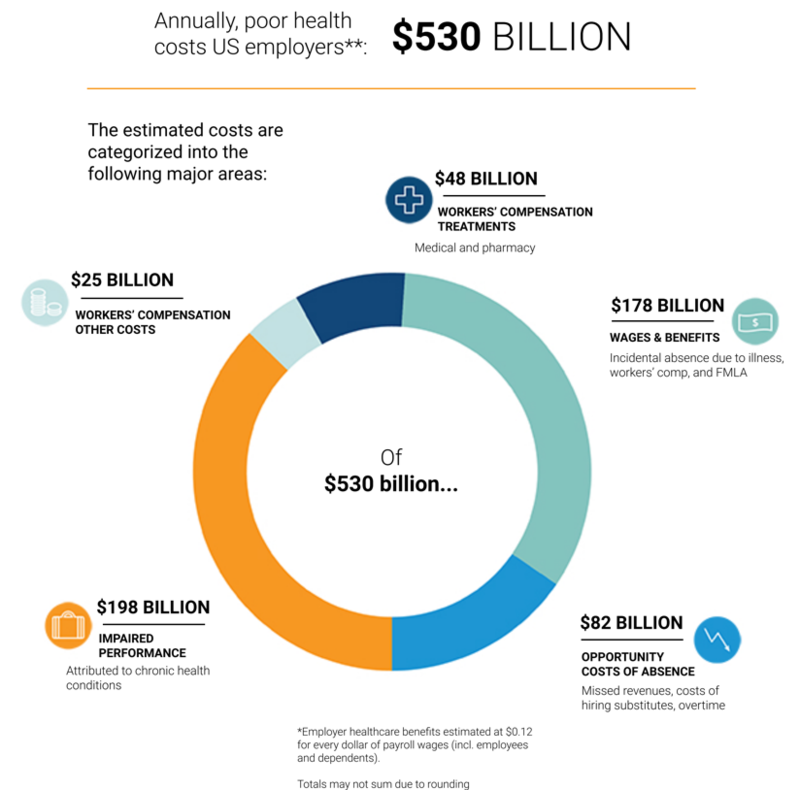 One report indicates illness-related lost productivity costs employers $530 billion a year. Addressing health care through wellness programs can reduce this cost. Productivity is always a huge concern for organizations. Numerous studies indicate how wellness programs aid employee productivity. For example, one study showed that wellness programs led to a 27% reduction in sick days and a 26% decrease in healthcare benefits. Wellness programs increase employee engagement and decrease turnover—which doesn’t just improve the experience of employees, but also of customers. In a tight labor market, having a wellness program doesn’t just help with current employees—it can be a competitive advantage recruiting new employees, since many candidates look for work-life balance at potential companies. Even as executives look at the return-on-investment (ROI) of programs, also encourage them to also look at the VOI, or value on investment, and how this initiative will drive the business forward. How will having a more engaged, more productive, more energized workforce help the company achieve its goals? Employee surveys can highlight pain points. Industry reports can help demonstrate the prevalence of wellness programs and highlight the risk of falling behind the competition. According to one survey, at least half of U.S. companies with at least 50 employees provide some type of wellness program. Another survey found that the number of companies providing wellness programs is increasing, from 58% in 2008 to 70% currently. Beyond keeping up with the Joneses, show why an employee wellness program is needed here and now. Highlight the benefits of a wellness program with evidence, meaningful data, and case studies, and tie those general benefits to the company’s specific needs. Does the company need higher levels of engagement, innovation, or creativity? Is absenteeism a problem? Are healthcare costs getting out of control? Are stress levels increasing? A company with these concerns should consider how a wellness program tailored to their needs could be beneficial. Change can be unsettling, especially when it involves a cultural shift. By working with leaders to create a shared vision of what this change will entail and what it will look like makes the process less intimidating. In addition to the C-suite, enlist champions throughout the organization who can support and communicate this shared vision throughout an organization. Use a pilot program to demonstrate success on a smaller scale. Once management has been won over, the program can be expanded. Programs don’t have to be expensive. In one survey, the most popular wellness benefits of flexible scheduling and telecommuting were not exceptionally expensive. Offering healthier food options at business lunches or having walking meetings are also low-cost ways to encourage wellness. Getting leader buy-in requires a plan that provides education, data, and relevance. This perspective helps leaders realize that they are the key to an effective wellness program and that effective wellness programs are the key to a company’s health.